The slab for this shed has had many lives before becoming the foundation for this latest project. It had been a dog kennel, held a rabbit hutch for awhile, and finally, it was an area for a chicken coop. The dog moved inside permanently – she was way too much a part of the family to spend time in a kennel! The rabbit was sweet but found a little girl to love her more than my rambunctious boys. We loved the fresh chicken eggs and how cute the little ladies were, but they also found a new home with a sweet, older immigrant, who promised to give them a good home. After the chickens left, the kennel sat empty for a few years, until Eric decided that he could use a tool and lawn mower shed. Frankly, I think he just didn’t want to bust up the concrete slab. I didn’t see the need for the shed, but decided that if I was going to look out my main living area at it, it was going to be stylish. I’d gotten the door from The RE Store when we’d done some remodeling a number of years ago. It is from Garfield High School, and I like to think it was graced by former students Jimi Hendrix and Bruce Lee. MLK, Jr. spoke there, and I wonder if he may have walked through it too. It ended up not working for the house, and sat much like the poor rabbit my children had ignored. It grew mildewy and dingy – out of sight and out of mind. But when the shed project came along, I knew the door would have to be a part of the project. (The moral of that anecdote is that if something at The RE Store speaks to you, get it! You’ll find a place for it). I’m very proud of our funky, little shed. As the shingles were all leftovers, they couldn’t complete the entire siding. I’m glad it turned out that way because I think the metal siding gives an eclectic and more “architectural” look. Other building materials include leftover lumber and OSB. I also think the way the pieces of lumber don’t “match” gives the shed an interesting, organic look. I considered taking a picture of the interior of the shed. It’s completely unfinished, but thought maybe a peek at the “bones” would be helpful to somebody. But, alas, the shed that I didn’t think was necessary, is already packed full of stuff – mostly my “junk” mind you – and just one lawn mower and a few tools. Happy building – remember the 3 Rs, and live in peace. 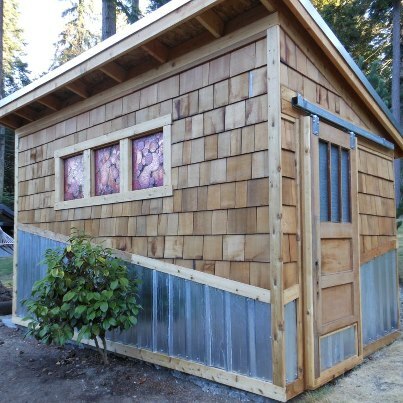 Thanks so much to Karen for this guest post and a great story of an inspiring little shed!